I greet our patients and bring them to the back of the office to take X-rays, clean their teeth, and give them instructions on good oral care at home. I absolutely love dentistry and would have to say my favorite part of working here is helping our patients become better educated about oral hygiene. I grew up in Arizona and have lived in Kansas City for about 20 years. My husband and I have two children: a daughter in college and a son in middle school. We also have three dogs that are amazing friends to us. I enjoy working out on weekday mornings and traveling whenever I can. I’m responsible for greeting our patients both in person and on the phone, preparing and reviewing all aspects of the schedule for the following day, making post-op calls, calling insurance to verify coverage and benefits, and monitoring all aspects of collections. I have more than 30 years of experience in this field and love interacting with our patients and the wonderful team we have here. 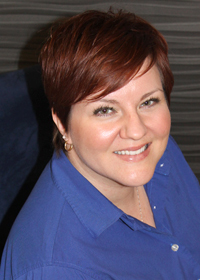 Dr. Weimer is gentle and flexible and we all truly care about our patients. I grew up in the Northland and currently live in the Weston countryside with my husband of 39 years. We have three wonderful daughters, nine grandchildren, two dogs, and a cat. I enjoy quality time with my family, swimming, going to theme parks, gardening, canning, comedies, attending our grandchildren’s sporting events, and making home-cooked meals for family and friends. I make sure that our patients are comfortable while I clean their teeth, take X-rays, and assist the doctor during dental maintenance visits. I really like making our patients feel at ease and giving them a “makeover” when it comes to their dental cleaning needs. Our team is fabulous and we have a fun and respectful atmosphere in the office. I’ve been married to my husband Tony for almost 20 years. We live in the Northland and have two daughters: Ashley, 22, and Courtney, 18. 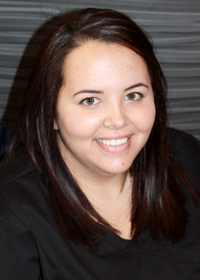 Ashley has completed college and Courtney is a freshman pursuing a career as a medical sonographer. We love to travel and Tony and I have both served at our church in the youth department and on three mission trips to Thailand. I answer phones, schedule appointments, complete various insurance tasks, call patients to schedule appointments, send out reminder cards, create and send out marketing materials, manage our Facebook page, and monitor OSHA and HIPAA for the office. 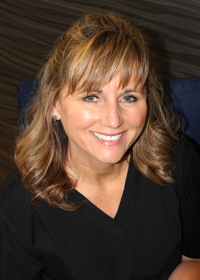 I’ve been here since 2007 and love interacting with our patients and encouraging them to maintain their oral health. Our team supports and encourages each other every day, which I truly appreciate. I grew up in Independence and currently reside in Liberty. I’ve been married since 2005 and have two boys, Owen and Chase, and a dog, Jake. Away from work I enjoy going to movies, cheering on the Chiefs and Royals, trying new restaurants, shopping, reading, going to the lake, and weight lifting. I assist Dr. Weimer with all procedures and am able to perform some of them on my own. I’ve been through rigorous extended training and am licensed to perform these procedures. I also keep the clinical part of the office organized. I love working with Dr. Weimer and the staff here; we’re like family. I was born and raised in Lawrence, KS and am a huge Jayhawks fan! My husband and I have four children: Cody, Courtney, Cailin, and Connor. We love spending time outdoors, going to sporting events, and being with friends and family. My duties include: patient care, room preparation, sanitation and clean-up of the instruments, operatory and back office area, and chairside assisting such as passing instruments and running suction. I’m currently attending UMKC working on a pre-dental chemistry degree and will be applying to UMKC’s dental program next year. I love coming to work here with the awesome staff and doctor in such a beautiful office. Dr. Weimer has really taken me under her wing. She teaches me so much each and every day about all sorts of different procedures, and about anything I have questions about from school. I love to cook and my husband is a chef, so we do a lot of cooking together. We were high school sweethearts and have been married for three-and-a-half years. I participate as a volunteer as much as I can and Team Smile is an organization I work with quite a bit. I also love animals and volunteer with the KC Humane Society.